For those who live and breathe by two-wheeled transportation, bicycles are more than just a way to get from here to there. The immediate, wind-on-your-face freedom of pedaling fast is a feeling that just can’t be matched by wandering around, road-tripping, or pretty much any kind of public transport. 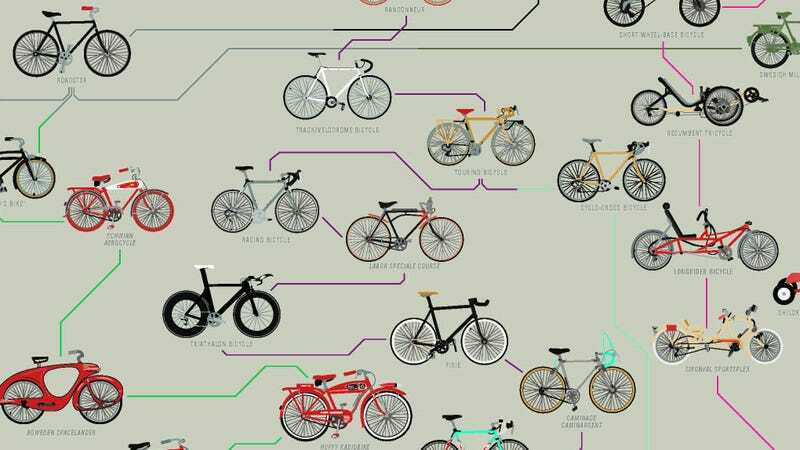 For their latest foray into in-depth visual breakdowns, data viz wizards at PopChartLab have turned their attention to the design evolution of cycles dating back a whopping 233 years. Organized chronologically from top to bottom and color-coded by style of ride, the graphic gives a neat glimpse at how the styles have changed through the years. In spite of my avowed allegiance to my dear beloved road bike, there’s a bunch on there I wouldn’t mind testing out around town. Also, question: Has anyone out there ever tried a penny farthing? You can purchase an 18”x24” print for $27 here.